Was a call to arms in securing one hillside really worth the cost? 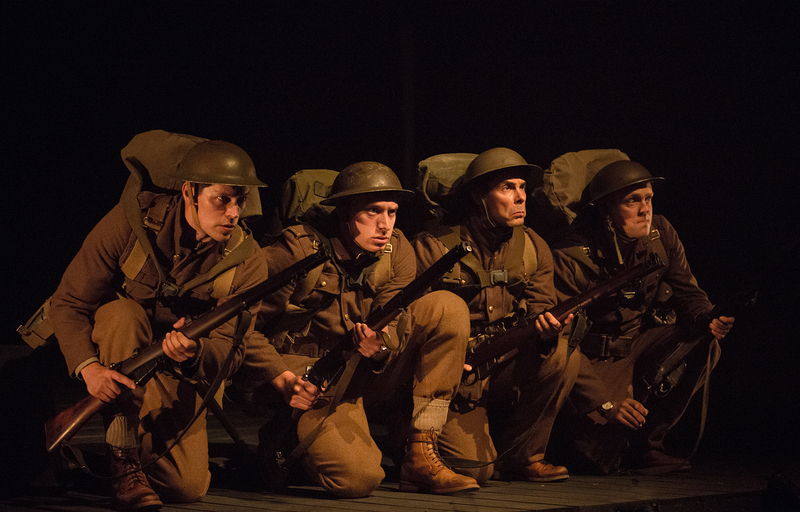 The Soulpepper Theatre Company presentation of Vimy, on stage until August 5, 2017, meditates on the better times before blood began to spill. Debate it until the cows come home but each and every one of us is on a mission to achieve something. Alone as we may feel in the trenches of fear, frustration, and the outright desire just to live another day, a primary objective of some sort is always in sight. Playwright Vern Thiessen doesn’t drop any bombshells in his dramatically powerful play Vimy but the storyteller extraordinaire helps lift the fog of war by perfectly capturing the human psyche of a handful of WWI Canadian infantry whose only ambition is to get back home. With so much written about the sons and daughters sent off into harm’s way throughout this past century, it’s hard to imagine a unique perspective—not necessarily an assessment—for us to call our very own. On this particular landscape of poison gas, shrapnel, broken bones and blindness, the anti-glorification of armed conflict is by no means the target. Instead, the memories of 5 young men create an armada of emotion in this heart-wrenching tale of the before and after of a nation’s defining moment on the world stage in April 1917. The play’s first Act cleverly builds back stories for each central character before Act II pushes forward with a countdown to “Zero Day.” Get ready for over the top performances by a cast that avoids over delivering intensity natural to the storyline. Director Dianne Leblanc lets out a victory cry in this production that is theatrically combat ready in part due to Astrid Janson’s effective set design and Andre du Toi’s illumination tactics. It’s not a play that would have the same kind of impact if not for this stand-alone collaborative achievement. You’ll easily surrender to Vimy for not taking issue with the morality of war or attempting to dispel the myth of it being an end to justify its means. Everything else is frontline deliberation material.